A few minutes after the announcement that Judge Sergio Moro had issued an arrest warrant against former President Luiz Inacio Lula da Silva, the international press began to report the fact. The first notes came from the international news agencies Reuters ( UK ) and the Associated Press (also called the AP, United States ). Both agencies issued the notes as a matter of urgency for press vehicles aroundthe world . But the main newspaper of France and French - speaking countries, Le Monde , highlighted the issue of orders d the prison on the cover of your website in French . In the news, the newspaper explains that "sentenced to twelve years and a month in prison for corruption, the icon of the Brazilian left has until Friday afternoon to introduce himself to the police"
The French newspaper says that "Lula, president from 2003 to 2010, remains the most popular political figure in Brazil, despite his conviction in six other corruption cases brought against him." The influential British newspaper economy Financial Times also highlighted the orders d the arrest , citing translated excerpts from the order made by Moro. In an article titled "With Lula outside, Brazil's leadership is totally open," Forbesmagazine states that "if the chances of former president Luiz Inacio Lula da Silva for a third presidential term were one in ten, yesterday's decision by the STF now reduces it to zero. " The Forbes also calls the Brazil of "land resources [court]." 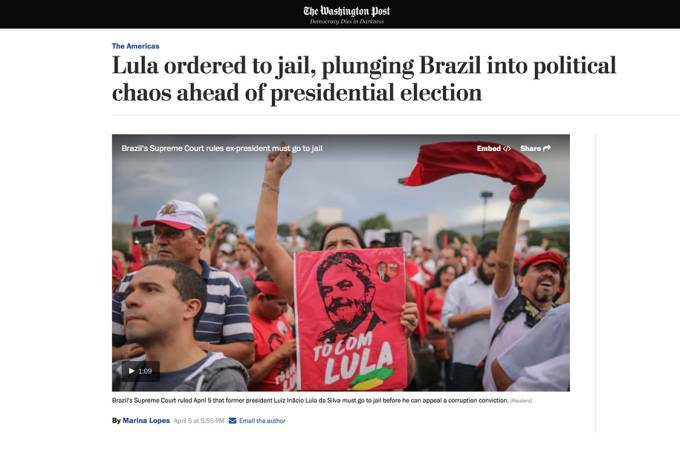 In an extensive article , The Washington Post notes that Sergio Moro's warrant was a "surprising move that should spur widespread protests in a country already swung by the Federal Supreme Court ruling earlier in the day." The article, titled "Lula is sentenced to prison, sinking Brazil into political chaos before presidential elections," states that "the split decision of the Supreme Court reflects the public opinion polarized about Lula, 72, a charismatic figure who is credited with having removed 20 million from poverty during his eight years as president, but who is also embroiled in criminal charges. " The American newspaper article concludes, however, that in spite of the momentous political chaos and lack of clear leadership in the Brazilian left for the November presidential elections, the STF decision on Thursday that paved the way for the arrest warrant issued by Moro , over time, "will bring the clarity expected in the political scenario of Brazil, which was obscured by the uncertainties about Lula's fate.